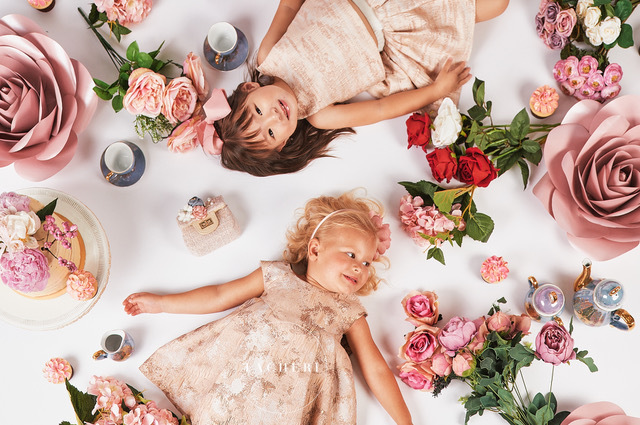 This week on FEW Member's Corner, we would like to introduce you to Roomila Chandra, Founder of Tachéri, a new children's luxury occasion and party wear brand. Hello Roomila, could you tell us a bit more about your journey? I'm a mom of two who just launched a new children's luxury occasion and party wear brand. Tachéri aims to empower children and promote confidence, positivity and happiness, while inspiring moms and dads to celebrate all achievements and occasions, big or small and live happy. We encourage you to celebrate more and make life’s best moments even better. My background lies in Economics, however I knew that Finance was not the right path for me, and craved a creative outlet. After working in Sales and Marketing for a high-end children's apparel company in NYC and in a Public Relations firm in Hong Kong, I merged the two experiences into the business I've created today. My kids inspired my business. When my daughter was one, I wasn't able to find a well-priced, special occasion outfit in Hong Kong. I could either go for the high-end designer brands that were priced extremely high or get something cheaper but of poor quality, which I did not want for my daughter. That's when I decided I would create a brand of high-quality designs which would be more affordable. I also decided it would allow young kids to enjoy wearing elegant, sophisticated garments, which was comfortable enough to play in but still party worthy! How do you manage your time, between your kids and launching a new business? I believe the best way to manage my time, is to plan ahead as much as possible. Since I work from home or out of cafes at the moment, it’s important to set aside fixed time slots in my calendar to spend on my business. This helps to plan my days effectively and ensure I have enough time with my kids when they're back home from school. I’m also class parent for my daughter’s class at HKIS and it’s important to have an organised planner so I can plan for and attend important class events. However, after starting my own business, I’ve also learned that everyday can be different, and there are days where I need to spend more time on my business, while carving out more family time on other days. Having a work-life balance is difficult when you start your own business, however I like to measure that balance over a week versus in a day. If I know overall I’ll be giving enough time to both family and work when I’m planning for that specific week, then I’m happy. I also make sure to keep time aside for date nights with my husband and dinners with friends, which I find helps me stay happy and motivated. What sort of strategy do you have to ensure a successful launch of Tachéri ? As a mom, my definition of success from a business perspective is to really help my target consumers understand the important key elements that I focus on when designing my collection. I understand the demands mom have when it comes to high-end party wear for their young children. Moms want the best quality fabrics for their children, especially for the age range we design for, which is 1-5 years old, given that their skin can be quite sensitive. They also want to know that their child will feel comfortable and be able to play and stay in their beautiful garments when at a specific occasion. As a mom and a designer, these are specific needs I would want for my children myself and I know other moms are looking for these same requirements when buying high-end party wear for their children. Hence, there are a number of key elements incorporated in my designs to ensure the child wearing them will enjoy dressing up and most importantly feel comfortable when wearing their special Tachéri outfits. Hence for my brand’s launch, I’m focusing on a more organic approach where I have the opportunity to meet moms one-on-one at different pop-ups and exhibits and build that trust and help them understand the amount of care I take when designing my collection in terms of producing a comfortable yet formal outfit that’s party worthy! It’s also important to note that all our designs are hand washable or can be machine washed on the delicate cycle as I try to avoid dry cleaning to limit the amount of chemicals placed on the garments and as our way of protecting the environment. Collaborations with mummy bloggers and other high-end children brands are also on the horizon to help build our brand awareness and grow our online following as well as building out a robust blog on all matters of celebration to provide additional value to our key audience. Make sure you work on an idea you absolutely love no matter what people tell you, it'll get you through the tough times. Make sure you have a network of women who will support your idea and be there when you have an issue or when the going gets tough - this can be an online group of ladies, or friends and family. What is your personal success? What is company success? My personal success is to wake up every morning excited to be working on the project at hand. My company success would be to have a strong following of customers who love my product and understand and appreciate my company's vision and mission.